Not all socks are created equal. I have a drawer full of socks just for hiking and backpacking. Winter blends, summer blends, tall, short, wool, synthetic, thick, thin, you name it and they are probably in there if you dig. Despite all the options I find myself going to the same few time after time and am always a little nervous when trying new pair. Is a Cold Drink "Worth the Weight"? While I have learned to accept that lukewarm water is a fact of life when spending long days outdoors, that doesn't mean that I don't dream of having a cold refreshing drink on hot days at the crag or on long summit approaches. Unfortunately in Southern California cool refreshing mountain streams are hard to come by. Always trying to be conscious of weight… I contemplated the pros and cons of an insulated water bottle. Summer OR is so big that it overflows into over a huge area across the street from the Salt Palace with 3 giant tents, two outdoor water tanks (one for flyfishing and one for paddling) and a tailgating area. And this is in addition to filling all of Salt Palace as it does in the winter. The Pavilions tend to house the newer and sometimes smaller companies. Here are 3 things that caught my eye and I am looking forward to trying. Aquabot by Lunatec: Designed and created in San Diego, CA this addition to your water bottle came from the desire to stop wasting the precious water you have just took the time to filter when camping. The cap turns your existing Nalgene or Camelbak bottle into a pressurized super soaker with 3 settings: jet, shower or mist. It allows you to drink from an upright bottle without sucking or tipping, wash dirt off things with a high pressure spray or cool off with a mist function. Sound cool? It is. They currently have a Kickstarter campaign going and you can be first in line for your Aquabot when they come out this fall. Scrubba Wash Bag, MSRP $54.95: Basically there is not longer an excuse to be a dirty stinky backpacker or traveler. The Scrubba Bag allows you a solution to efficiently and effectively wash and clean your clothes when on the go. Dogger Jogger, MSRP $48: Need to get exercise your high energy pup and would love to take them on a bike ride with you? We have all see the people riding their bikes while holding the leash... crazy! Or the contraptions that have them attached hands free to your seat post... seems like a difference in opinion of which way to go will bring you both down. Bill, the inventor, wanted a safer alternative and created the Dogger Jogger. Check out this new safe way to take a ride with your four legged best friend. How does it work? Outdoor Retailer: Day 0 - It was a wet one! Thunderstorms did not keep the crowds away at Outdoor Retailers Open Air Demo! The enjoyment of our Feathered Friends sleeping bag began on my first phone call to the Seattle based company, the person who helped me spent a good amount of time on the phone as we figured out the build of my new bag. We discussed down fill choices as well as the coating and material of the bag and color options. The bag I chose was their award winning Spoonbill UL, which is a specialty bag that is built for two. It has the same fill as their 20 degree bag, but because two people are in it the rating of the bag is dependent on how warm a sleeper the residents are, Saveria is a warm sleeper so I knew we would be in good shape for our WTC snow camp. When I received the bag it was in perfect AdventurUs colors, which was an added bonus. We were so excited we tried to sleep in it on our bed for a couple of days, but it was a bit too warm for indoor use. The first time we used it was on a weekend trip to Joshua Tree NP in late February, it was actually a little warm but with the half zips on either side we were able to regulate our temp very easily. We finally got to put the bag to the real test over a March 2 night / 3 day trip in the Eastern Sierras. Our first night was just under 9000 ft. near a stream on dirt where it dropped to 19 degrees, the only thing cold was my nose. It easily stuffed away, about the size of my 15 degree bag and Saveria carried it (don't feel too bad I carried the whole tent...and our Jetboil Sumo too). Our second night was just under 10,000 ft on snow above a lake, the temp felt warmer and was a perfect nights sleep. We got a "regular" length, I am 6'2" and Saveria is 5'1", sorry 5'2" :) and we both fit in easily with any clothes we wanted to stuff in the bottom. My experience ordering to using the Feathered Friends Spoonbill could not have been better. A big thank you to them and a big recommendation to anyone looking for a great 2-person bag . As far as wool versus synthetic, I usually go to synthetic for base layers and the like, but lately I was searching for a good mid-weight glove for use while hiking in the winter, enter the Black Diamond WoolWeight glove. First, I did size up for these gloves, the other Black Diamond gloves I have are size large (except my over mitts), but after trying on a pair I went for the extra large, it was the right choice, it helped with the dexterity I was after. But truly where these gloves shine is how quick they dry and the comfort they provide during hiking efforts. I wore these on a snow shoe day hike on Mt. Watermann in the Angeles National Forest with Saveria and our WTC class. At the first rest stop I was adjusting my snow shoes and I was easily able to deal with the straps but my gloves did get covered in snow, they felt damp on the outside but my hands were still warm. We began to hike, and the next time I checked my gloves were dry. The next I wore these as my main gloves was on a three day snow camp in the Sierras. 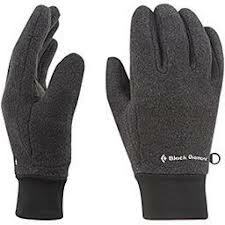 Again the range of these gloves was perfect, from hiking during the day to cold 20 degree nights. I love gloves and finding the perfect ones for a specific situation is always a fun challenge. These a great all arounders that pack small and cover a big range. Review: Don't Leave Home Without the Verto! "Don't leave home without the Verto!" has become a joke in our house as it seems everytime we don't bring our Verto Jacket (made by The North Face) we wish we had. It is an ultralight, ultra-compressible shell that just gives you that little extra protection from the elements to get you through the day. And based on it's size, it packs down to a little bigger than a CLIF bar, it is pretty silly that we wouldn't always bring it. I am not sure if they are still making this jacket as it is not on their website, but you can still find it online at sites such as http://mountain-op.com. We also love the Verto26 pack which doubles as a sleeping bag stuff sack and summit pack, working double duty to save weight.